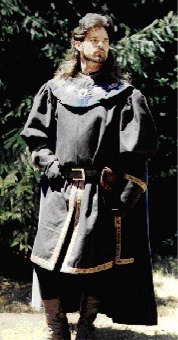 A complete ensemble including Tunic, throw tabard, mantle, cloak and matching cloth gloves for only $450! All you need are dark pants and boots and you are set. This outfit is suitable for fighting or just hanging about at the tavern awaiting your next adventure. Comes in a range of colors, contact us with your preference. One of our most popular items, this out fix ooozes intimidation. 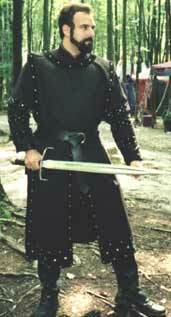 Black with silver stud work along the double sleeves and mock-tabard. made from durable 7oz twill Comes with leather ring belt and plain front. For Embroidered fronts, add $100. This is one of our most versatile outfits with many different looks depending on accessories and extras. a few of these a show below, but to be honest, you are limited only by your imagination. Hailing from a time when the world was untamed, and warrior like Nobles were needed to rule the land as much as the hearts of woman. The Gothic Noble was a man among men and lover among woman. 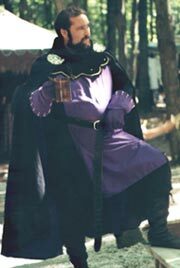 This ensemble includes the one piece tunic and cape, Gauntlet gloves, and a leather ring belt. These are only a few of the fine types of embroidery work we can do. Family crests and standards are no problem, but may require extra time to complete. For those whom just need a Tabard or for our owners of the King Richard that desire extra tabards to spice up their outfits, we offer the Richard Tabard 'a la cart'. The standard tabard styles are listed for your selection in the drop-down menu. If you require a custom design, choose 'custom' and attach a picture of the design you wish to an e-mail with your order number. If you do not have a copy of your crest or design and need us to help, just write; "call for design" in the comments box when ordering. We guarantee that you will look good in the Richard. It cannot be helped. The four or seven piece ensemble is a complete, interchangeable outfit that commands respect and awe. The full seven piece includes the Tunic, Mantle, Tabard w/ Crest, Cloak, Gauntlet gloves, Leather ring belt, & Pants. $100 added for any combination not standard.